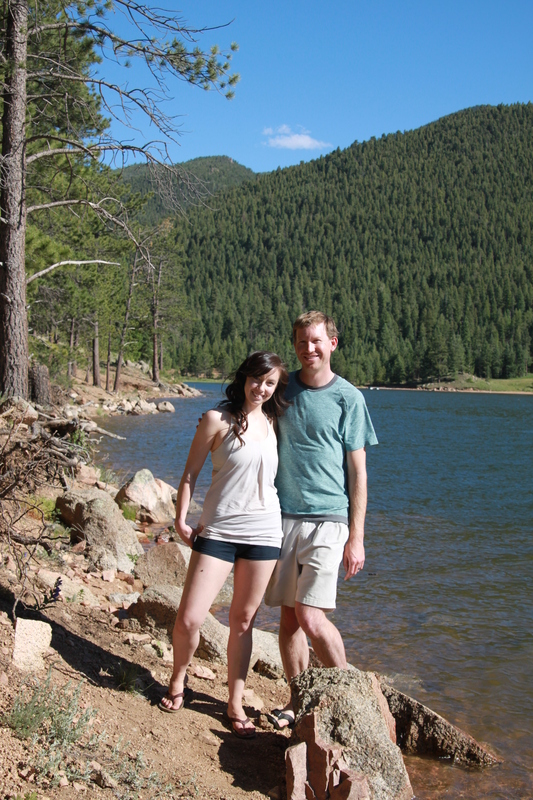 Pie and I love getting away from the city to be outdoors, so we had some pretty busy summers in New Mexico. As you can imagine, with the wedding now behind us and living in a new, big city that beckons to be explored, our first summer in Colorado has been even more busy! In New Mexico, our exciting summer activities were pretty much limited to escaping town to camp and hike. There just wasn’t much to do in town that was exciting, except grabbing a drink and bite to eat at a chain restaurant. Denver is a different story! There is so much to do in and out of town, from farmers markets to outdoor concerts to hiking on top of mountains with incredible views to enjoying happy hour at a new, swanky, local restaurant every week. One of the drawbacks of living in Denver is the fact that summer is so short! It didn’t truly feel like relaxing, craving-to-be-outside weather until June, and before we knew it, August was right around the corner! Where did the summer go? Luckily, we planned ahead and created the following 17 bucket list activities before summer even started because we knew that our Colorado summer would go by in a flash and we wanted to make sure we packed as much into our first summer in Denver as possible. 1. Camping – 1/2 DONE! Well, duh! This was a no-brainer to add to our bucket list since we love camping. Even when we lived in New Mexico, we were constantly driving up to southern Colorado to camp. We’ve already accomplished this bucket list with camping in Colorado a few times, but we would still like to try camping up north in Wyoming for a change, so we can’t truly check this item off our list just yet. 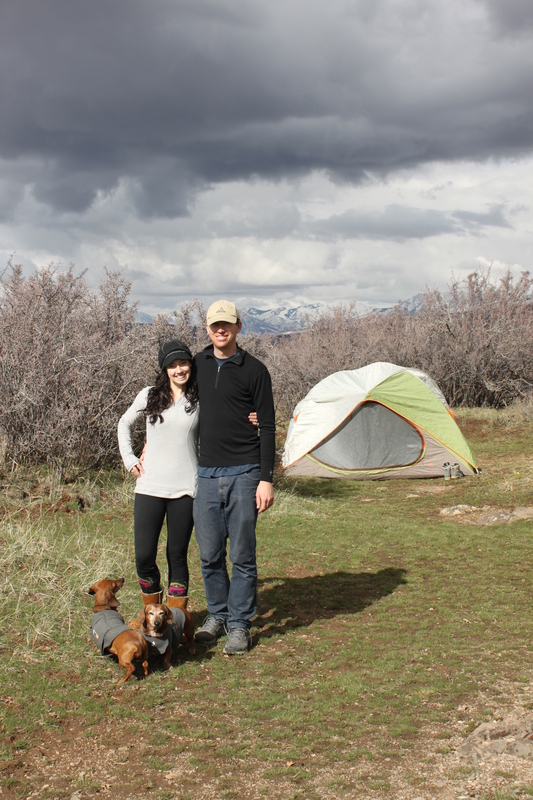 Technically not part of our summer bucket list, this Easter weekend camping trip to Black Canyon in Gunnison, CO was one of our first camping trips after moving to Colorado. 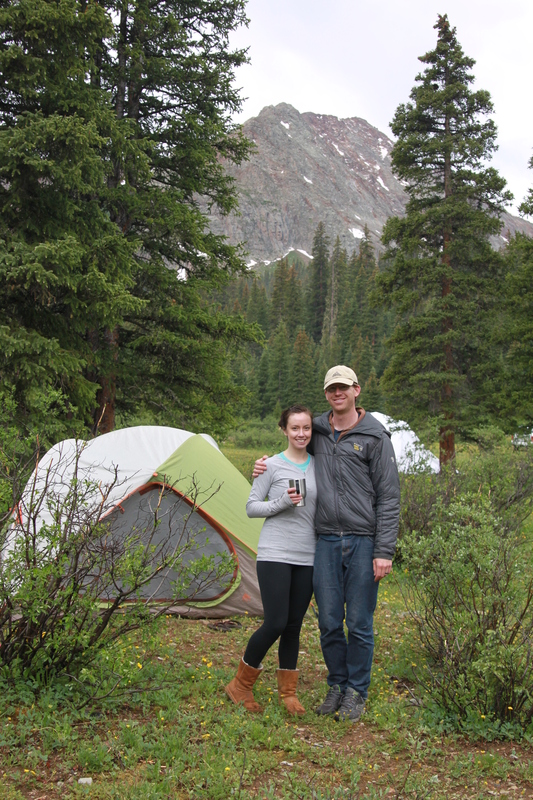 Also technically not a true summer bucket list item, this camping trip to Estes Park, Colorado, was a chilly, rainy, stormy Springtime adventure! Summer Bucket List Item #1 accomplished! 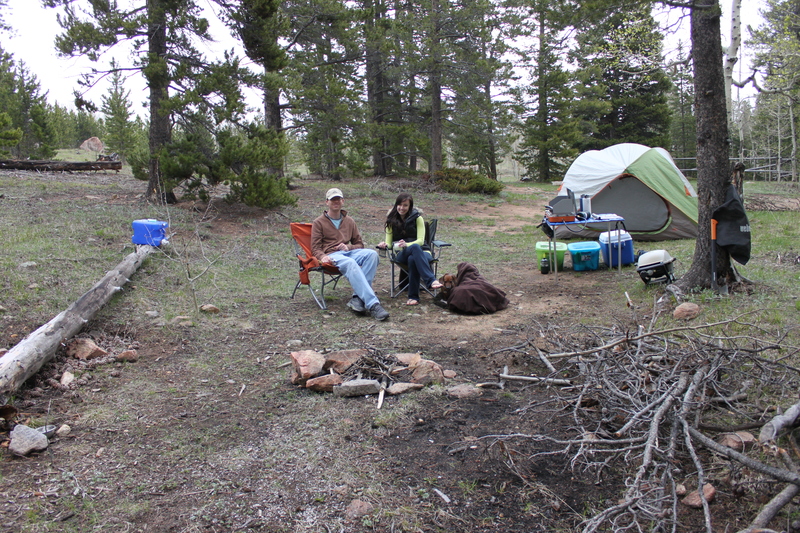 Camping trip to Buffalo Springs Campground in June. Camping in the South Mineral Creek Campground outside Silverton, Colorado for the Fourth of July weekend. We’ve been camping to this campground several times before we even moved to Colorado. Unfortunately we still aren’t any closer to this favorite spot now that we live in Colorado. Such a bummer! This is one bucket list item that may be a stretch for Pie and I to accomplish. We have the camping thing dialed in and every time we want to go camping, we just grab some groceries for the weekend, grab our camping box full of supplies, and run by our storage unit to get all our other camping gear that is conveniently set aside. It’s still a lot of work, but we’ve done the last-minute camping thing so many times, so it’s usually not a big deal to plan an impromptu trip when we realize we have a free weekend coming up. Backpacking is a different story though. We have yet to go backpacking even once during our relationship. While we would like to blame it on the dogs and having to carry their stuff in addition to ours, the only one to really blame is us. We just don’t know how to pack light. When we go camping, our vehicle is packed tight with camping gear and food… and that’s just for one night’s stay in the woods. So I haven’t been able to fathom the idea of packing everything we need into two backpacks. The dogs can do without their fancy beds for one night that we usually pack even on camping trips, but can we? We’ll see! 3. Farmers Market – DONE! I had never been to a Farmers Market before moving to Denver. I always envisioned a Farmers Market as a parking lot full of shade tents and wooden crates overflowing with local, fresh vegetables and herbs, but it turns out there is even more to them than just shopping for lettuce. There are quite a few Farmers Markets that start popping up mid-June. Some of them are just small ones that take place in a parking lot with a few classic vendors selling fresh veggies as well as other fun local vendors selling pasta, pastries, breads, honey, etc. Other Farmers Markets take up an entire neighborhood block and include food trucks, music, and local vendors. We didn’t waste any time checking this item off our list. We’ve been to a couple of Farmers Markets, and even though we rarely buy anything but a quick bite to eat, it’s just fun to get outside in the nice weather and walk through these with the fun, relaxed crowds. Bucket List Item #3 accomplished! 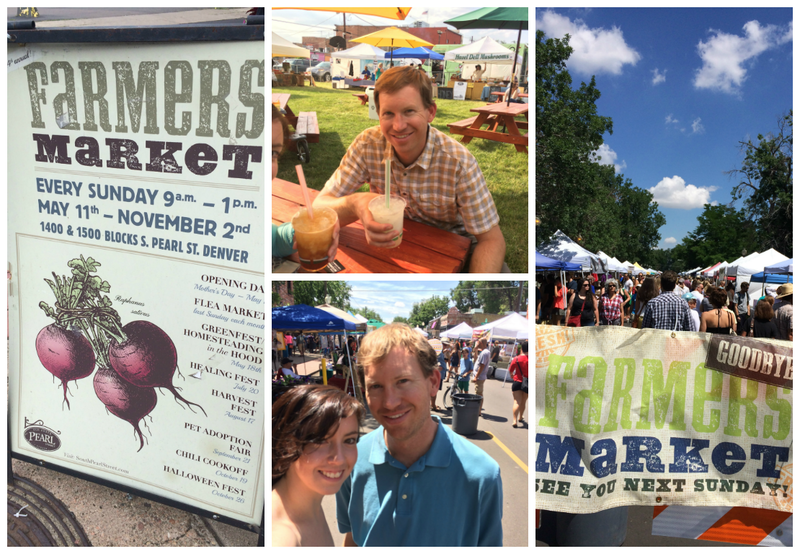 Visiting several Farmers Markets in Denver. My favorite Farmers Market purchase was the homemade sodas with huge chunks of crushed ice and gigantic straws pictured above. 4. Red Rocks Amphitheater Concert – DONE! Right outside Denver is a structure of — you guessed it! — red rocks that provide excellent acoustic surroundings for concerts. It is the perfect way to enjoy a unique, summer concert outside, so of course we added this to our bucket list! 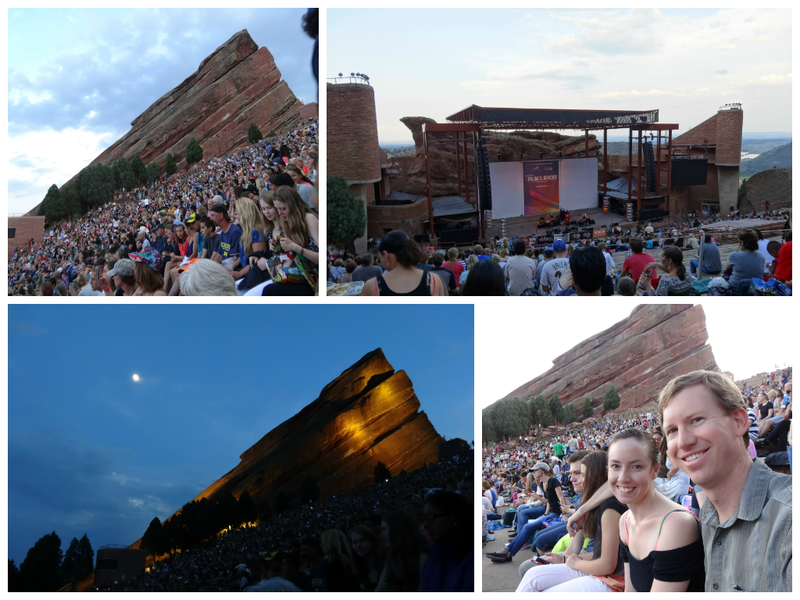 We have already checked this item off our bucket list and not only got to see a few bands play at the Red Rocks Amphitheater, but also got to see a movie as well, all in one night… for $13 per person! The Red Rocks Amphitheater has a summer concert series called Film on the Rocks where they have a few bands lined up before a movie plays on a large screen. The gates open at 6:30 pm, the bands start playing at 7:00 pm, and the movie starts playing at about 9:00 pm. It’s a really great deal for only $13 per person. You have to get there when the bands start playing though, otherwise you may get stuck with seats in the very far back since it is open seating. Pie and I arrived at about 6:40 pm and we were able to get decent seats to enjoy the bands and movie with great weather. This may be the latest we have and ever will stay up all summer. We got home at midnight and were so sleepy! Hey, don’t judge! We’re working adults and need eight full hours of rest. Bucket List Item #4 accomplished! Film on the Rocks at Red Rocks Amphitheater in July. For those of you that don’t know, a 14er is a peak above 14,000 feet in elevation and they are a fun accomplishment to brag about. Some 14ers are relatively “easy”, while others involve arduous steep, narrow climbs that require safety gear. To make some of these 14ers worse, if you don’t pick the ideal time of year to hike to these high elevation peaks, the trail could be blocked and covered in snow. It is better to do some of the 14ers starting in late June when most of the snow is melted. Still, even in the best of conditions and on the “easier” 14ers, there have been several fatalities caused by falls, cardiac arrest, lightning, you name it! Colorado obviously has a high concentration of 14ers; 53 to be exact. Some Coloradans’ bucket lists solely involve climbing all the 14ers that Colorado has to offer. Hubby has already done 15 Fourteeners by himself before he met me. It didn’t hurt that he grew up in southern Colorado, went to college outside of Denver, and didn’t have a girlfriend had lots of time to explore this entire wonderful state. Hubby and I have hiked to a few peaks and lakes just below 14,000 feet, such as Hope Lake (11,880 ft), Ice Lakes (12,257 ft), Whitehead Peak (13,271 ft) — all outside Silverton, Colorado — and Mount Taylor (11,305 ft) oustide Grants, New Mexico, but we have technically never hiked a 14er, so of course hubby and I needed to add at least one of these challenges to our summer bucket list. Hopefully we can squeeze one of these in this summer, but we are quickly running out of free weekends to conquer this bucket list item! 6. 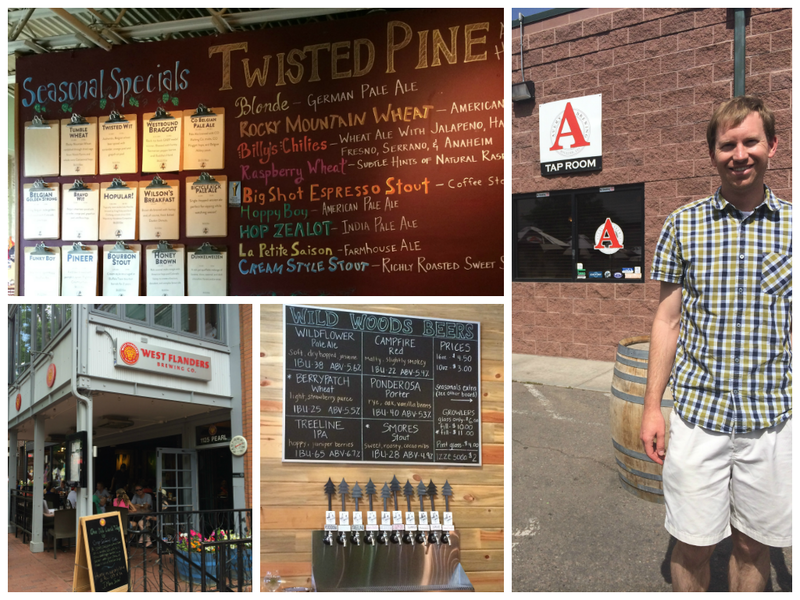 Boulder Brewery Tour – DONE! Pie loves beer. Surprise, surprise! …and I don’t! Wah wah. While I wish this bucket list item was a margarita tour, sadly, those just don’t seem to exist. 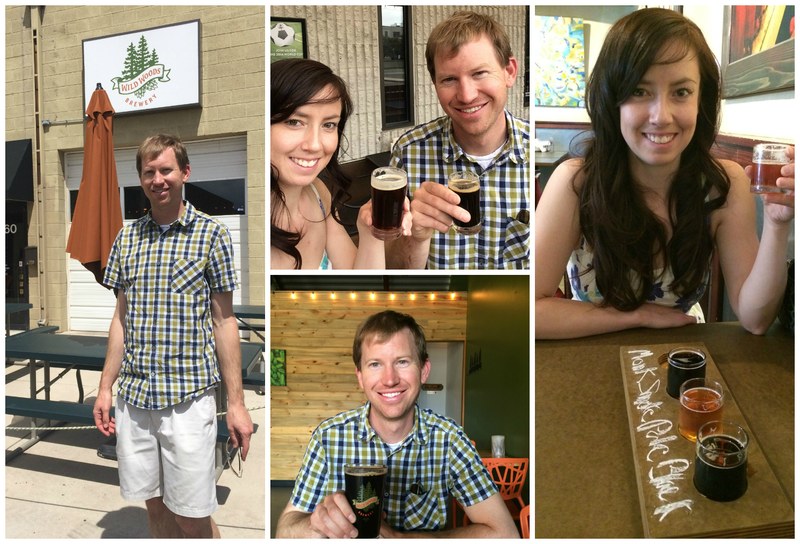 It’s all about the craft breweries here in Colorado, so I opted instead to give hubby a bucket list item he would really look forward to — exploring a bunch of breweries up in Boulder, Colorado, with his wifey! Can I get some brownie points please? We tackled this bucket list item early in June during a Saturday afternoon that I happened to be in a particularly good mood to drink a bunch of beer that I would not normally be so inclined to drink. We did four breweries in four hours and still barely made a dent in the supply of beer in the college town of Boulder. Bucket List Item #6 accomplished! Boulder Brewery Tour. We organized this one ourselves. I’ve never drank so much beer in my entire life! Hubby has! For Christmas, Pie and I received a Groupon for a walking food tour in Denver from his aunt and uncle. Wintertime is definitely not the time of year you would typically enjoy walking around Denver, so we have been holding onto this gift certificate for several months now, waiting to use it when our eating-out budget is low and the weather more desirable. One of the other reasons we have not used this gift certificate yet is because we have been so eager to explore all the amazing, trendy restaurants downtown after work on our own. We still have not exhausted our list of restaurants that we would like to try, but we need to hit the pause button on our list and let someone else show us the great local places to eat that Denver has to offer! We haven’t decided which tour we will do, but it sounds like we can’t go wrong! Back in New Mexico, hubby and I went to a really awesome indoor rock climbing gym about two or three times a week. New Mexico also has some pretty spectacular outdoor sport rock climbing areas, but, unfortunately, we did not get out to them as much as we would have liked. Although we haven’t had the money or time to get a rock climbing gym membership here in Denver, we would like to get back into this sport and do a climb before the summer is up. It will be interesting to see how Colorado’s outdoor sport climbing areas compare to New Mexico. Every time Pie and I are walking downtown headed to a dinner date or happy hour, the pedicab guys are always shouting to us and asking if we want a pedicab ride and each time I have to painfully decline. It’s not that I’m too lazy to walk. In fact, hubby and I love walking around downtown. The pedicab rides just seem like so much fun!!! Who wouldn’t want to be spoiled and bicycled all around downtown? I insisted that Pie and I get to do a pedicab ride just once, to get it out of my system and so he can stop seeing my pouty face every time one of these guys rolls by us with another couple that isn’t us. 10. 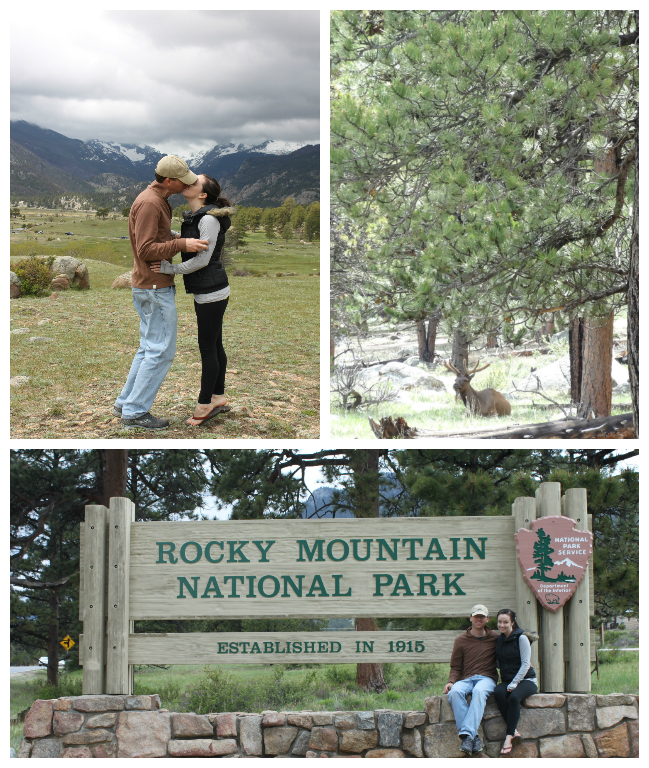 Rocky Mountain National Park – DONE! Rocky Mountain National Park is the iconic Colorado destination. This bucket list item needs no further explanation. It’s just a gorgeous place to visit in the mountains. Unfortunately, because Rocky Mountain National Park is so iconic and so easy to get to from Denver, it can get very crowded. It would have been lovely to not just visit Rocky Mountain National Park for the day, but also camp there, however, the camp sites fill up very quickly. We ended up camping about 45 minutes away from Rocky Mountain National Park, outside Estes Park, Colorado, and I enjoyed this option a lot more. Even if we had been able to camp at Rocky Mountain National Park, it would not have been ideal for us to camp in a crowded area with our rowdy pups. And as it was, I was tired enough of the crowds we had to deal with just while driving around the park and stopping at the viewpoints. Pie and I are really spoiled with a lot of the gorgeous places we hike, camp, and visit in Colorado because they are hidden gems that are usually harder to get to by car and by foot, eliminating the crowds that can be found at most of the National Parks. Nonetheless, our visit to Rocky Mountain National Park was amazing. Within minutes of getting in the park, we had already spotted an elk resting in the grass not far from the road. We definitely hope to visit Rocky Mountain National Park again this summer and hope that the skies will not be as cloudy so we can see the snowy peaks that usually decorate the background of the picture below. Bucket List Item #10 accomplished! But we’ll still need to go back to Rocky Mountain National Park on a clear day so we can see the beautiful peaks that should be visible from this amazing meadow. Working in downtown Denver, the heart of the city and the center of the action, is just so much fun! What more can I say? Sure, downtown Denver has the crazy bums and homeless people, but it also has a lot of things to do to distract you from the crazies roaming 16th Freak Street Mall. In the summer, not only are there a million places you can visit for happy hour on a patio after work, but even during your work day, you can take a break from your desk and have lunch outside, followed by a game in the park. One of the small parks in the middle of downtown Denver, called Skyline Park, hosts a bunch of free games such as ping pong, bocce ball, ladderball, and various board games. My favorite game, though, is the miniature golf because the creative obstacles they have set up are truly one of kind. They are miniature versions of iconic downtown structures, including several buildings, a bridge, a ferris wheel, and several more. We should have had this bucket list item checked off a long time ago, as we sit in Skyline Park almost every weekday for lunch, watching men in suits and women in heels taking a break from their day to play miniature golf, but we still haven’t gotten around to playing. Washington Park, which is actually called Wash Park by the locals, is one of the biggest parks in Denver. It is located only a mile away from our apartment and I love this park because of its 2.5 mile running trail around it that I frequently use. Wash Park also has two small lakes that sometimes have pelicans in them, which I find especially fun to watch while I run. The best part about Wash Park is the people. I can be running at 5 am in the pitch dark and still see fellow runners out! And in the afternoon, there are a ton of people out running, biking, rollerblading, playing volleyball, you name it! As a Kinesiology major, I get especially excited to see so many people outside being active. One of the two lakes at Wash Park has paddle boats and since Pie and I love biking so much, it makes sense that we would look forward to “biking on water”. This bucket list item is not that grand, but it does seem like a fun way to enjoy an afternoon in one of our favorite parks. 13. 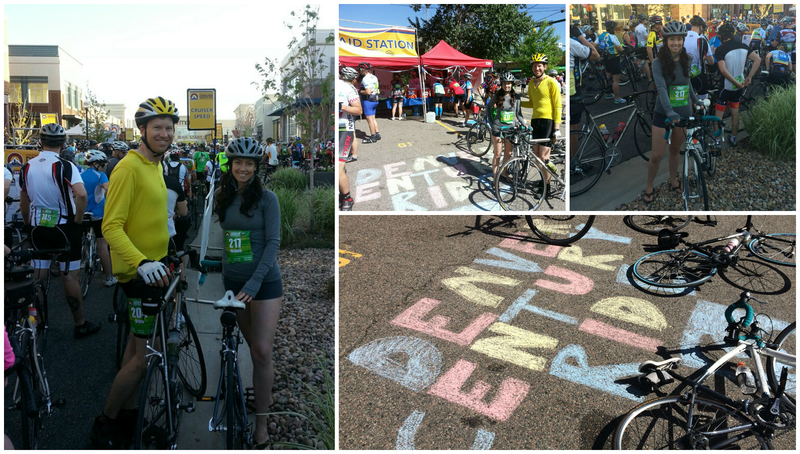 Denver Century Bike Ride – DONE! Ah yes. The Denver Century Bike Ride. This was probably the first activity that was added to our summer bucket list before we even had a summer bucket list. Hubby found out about the Denver Century Bike Ride shortly after coming to Denver and was already signed up for it in the winter. He had already done a century bike ride once before in Albuquerque and I thought he was crazy at the time for doing it. Ever since I purchased my first road bike in 2009, I have become addicted to biking everywhere I go. Even though I bike to work almost every day, the idea of riding 100 miles in one day seemed a bit absurd… until this year. There’s something about getting old that makes you crave doing exhaustively long endurance events that you thought you’d never want to do, like running marathons, riding centuries, and climbing 14ers. After hubby mentioned participating in a century bike ride in Denver in June, I also got the idea in my head that it might be a somewhat fun accomplishment to do, and even better that hubby and I could do it together. I may never get hubby to run a half or full marathon with me, but a bike ride is something we could agree on! Funny side note though – hubby has done only one half marathon before he met me and I have done several. It just so happens that he ran one of the same half marathons I was in, too, but we never realized we had both run the same race until we were cleaning out our closets before our big move to Denver and I came across the same race shirt that I thought I had just thrown out a few minutes prior to that. Small world! It’s too bad we hadn’t run into each other sooner, but the universe has a time and plan for everything I guess! There was just one problem with this century ride though and it wasn’t the 100 miles that was the problem. This ride included a 5 mile, 1500 ft climb up Lookout Mountain in the middle of it. Of course hubby could do it, but could I? It was February when this crazy thought first popped into my head that it would be “fun” to do this race with Pie and I figured we would have plenty of time from February to June to prepare for this event. However, between busy weekends, snowy weekends, and just plain lazy weekends, we just didn’t get around to as many practice rides as we would have liked. The race day crept up quick and the longest ride we were able to do before the race was 60 miles. However, we were able to ride up Lookout Mountain twice and I found that this section of the ride would not be as bad as I had imagined. Come race day, everything went really well. Hubby and I rode together for 80 miles of the race, until I hit a wall and just couldn’t pedal any faster. We both finished in decent time right before a down pour of rain came in. And not only did I complete my first century ride, but I did so in flip flops! It is summer after all!! 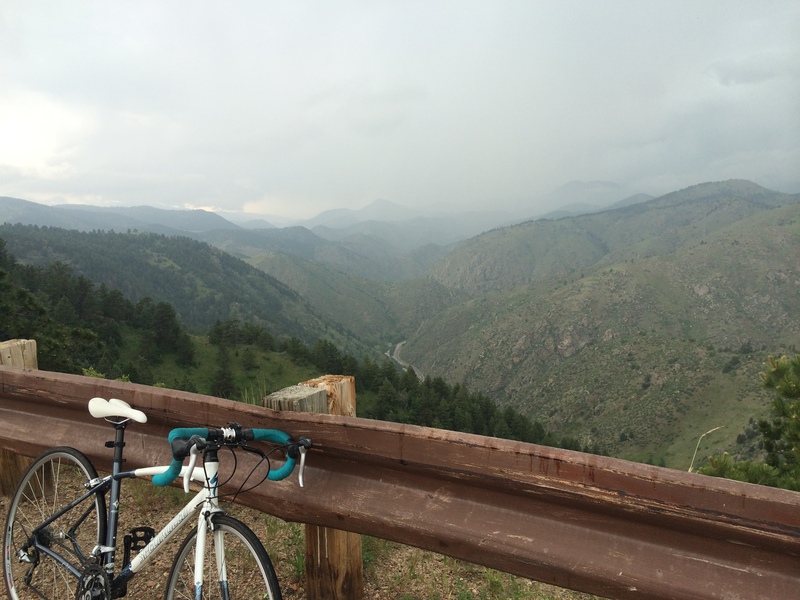 Our view halfway up Lookout Mountain in Golden, Colorado, on one of our rainy practice rides. Bucket List Item #13 Accomplished! Denver Century Bike Ride alllll over town… in flip flops! Whew! 14. Swim with a Penguin – DONE! This summer bucket list item has been accomplished; we just don’t have pictures to prove it yet! Coming soon! One of the big reasons we moved to Denver was to be closer to some of Bryce’s family that lives here. It’s no surprise that we quickly realized that everyone has their own lives and families and it’s not as easy as we thought it’d be to get together and hang out. So we wanted to organize a BBQ as an excuse to get everyone together. This is planned for August and we can’t wait, as some of the family we haven’t seen since our wedding in Breckenridge last August. 16. Whitewater Rafting – DONE! I have a love/hate relationship with whitewater rafting. When we’re driving down the winding Colorado roads that parallel the winding Colorado rivers, I excitedly watch the summer whitewater rafters having so much fun in the water. But the minute I sign up for this activity and actually think about what the whole trip down the river involves, including the rapids and rocks, I start to become less enthusiastic. Nevertheless, this was another classic summer bucket list item that had to be done. And guess what? It wasn’t as bad as I imagined! We rafted the Royal Gorge in mid-July and I had been especially worried about the river levels being much higher for this time of year than they usually are, but it actually turned out fine. Sometimes having higher river levels is better because there are less rocks to dodge. It also doesn’t hurt having a great rafting guide that does most of the behind-the-scenes work in making sure your raft doesn’t flip over in the tricky spots. Because heavens knows, my paddling sure wasn’t helping us get through the rapids safely! Our trip down the Royal Gorge with a rafting company called River Runners was about 5 hours long and included a picnic lunch break in the middle of it. Bucket List Item #16 accomplished! 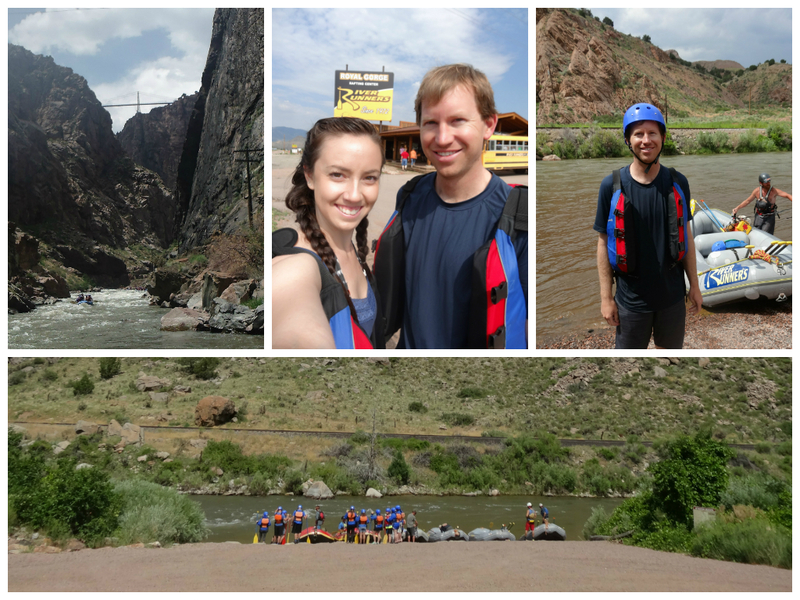 Rafting the Royal Gorge. Glad we made it out of this one alive! 17. Rockies Game – DONE but going back! The Colorado Rockies is Denver’s Major League Baseball team and they play at Coors Field, which is a stadium located downtown. I don’t typically get into sports as much as hubby, but if there are nachos involved, I’ll do pretty much anything. Besides, baseball games are the classic summer activity and it’s nice to take advantage of living in a city with a major league baseball team, even if they aren’t playing particularly well one summer. We have already been to two Rockies games this summer, but it would be nice to get some purple shirts and get in the true team spirit for a game (and a photo op!). Hubby and I biked to one of the games we went to this summer and won more tickets from a “Bike to the Game” drawing, so we’ll be back! !